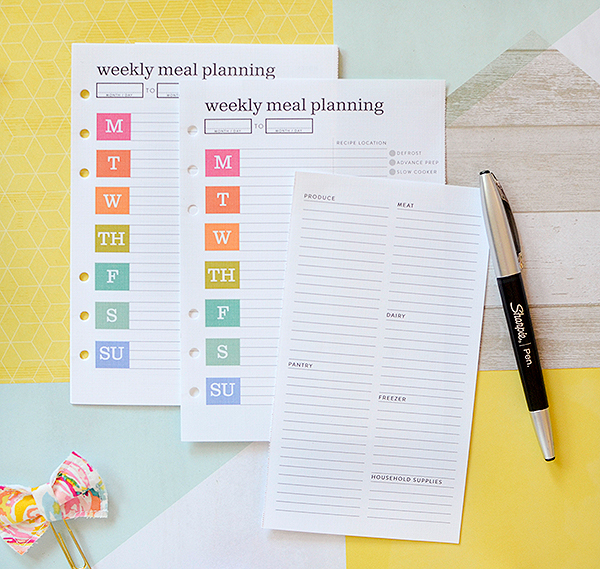 The Moments Inked Meal Planner System from Papertrey Ink is kind of ingenious. 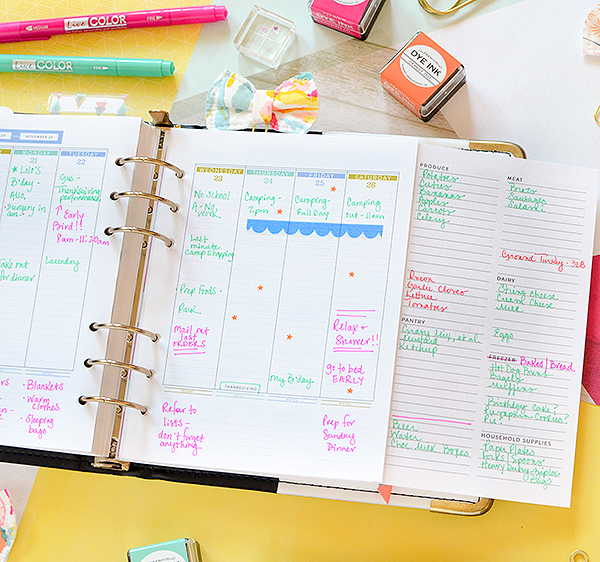 It's designed in an easy-to-use format that will keep me organized in the kitchen--and the grocery store--for the entire year. And it has come along just in time for our Thanksgiving camping trip! 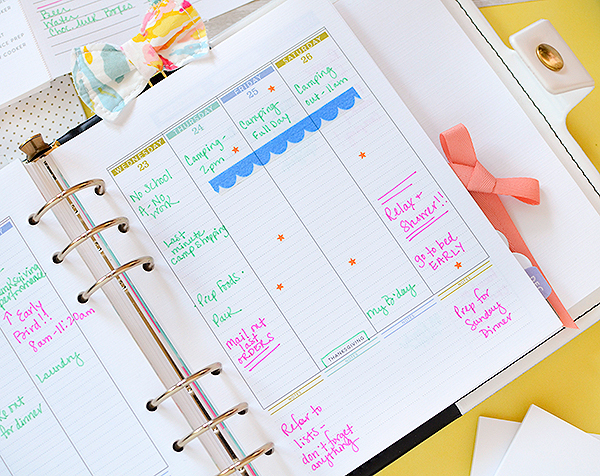 Without this meal planner, I might have gone completely mad trying to keep track of it all. Thankfully, I'm staying sane and organized instead! 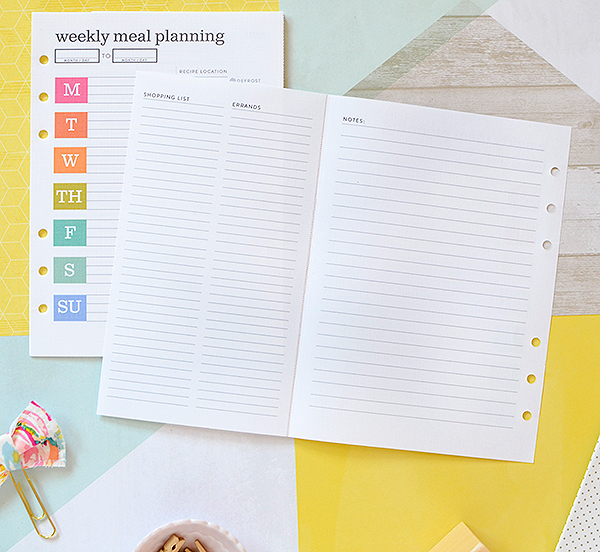 In this post, I'll share my review of the Meal Planner and give you a glimpse at how I'm already using it. 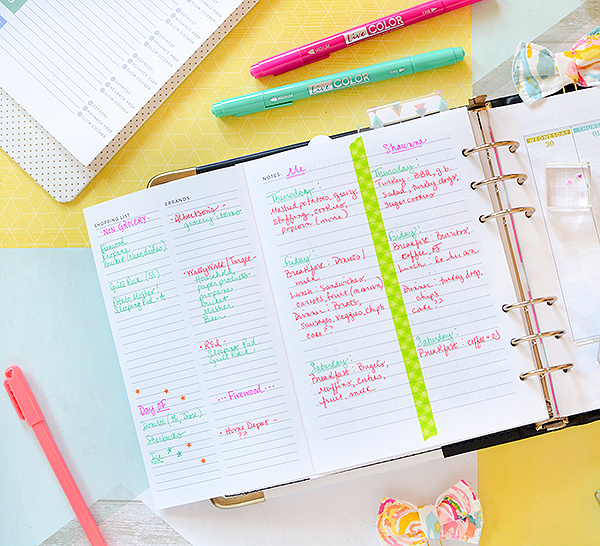 To start, here's a short overview of what the planner consists of. 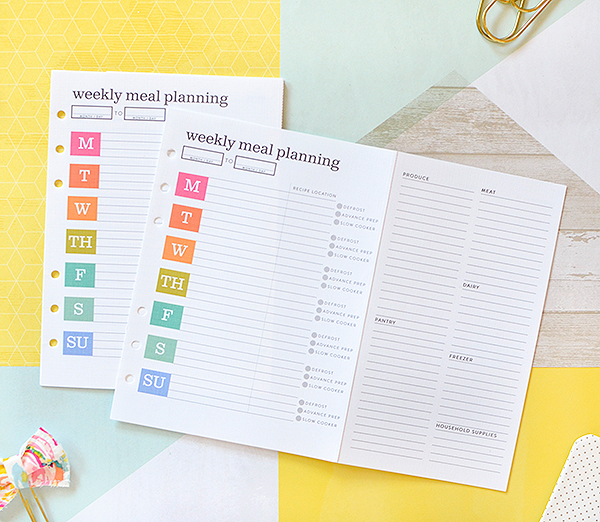 (*I'm using the Binder edition of the Meal Planner, with inserts that can be added into my binder planner. There is also a Spiral edition of the Meal Planner; it is a stand-alone book, but everything else is exactly the same. *) It's simply laid out, with 3 lines for each day of the week. I normally don't plan too much for breakfast and lunch, so I will use all 3 lines for dinner--that's what will require the most prep work, anyhow. There is a small section next to that where you can fill in the location of a recipe, and beside that is the very helpful checklist of Defrost, Advance Prep, and Slow Cooker. I have a frequent problem of forgetting to defrost or thaw frozen meat so I personally find this feature very useful. The page is folded, with a perforated edge that can be torn off because it's for a grocery list. This is the best thing ever! It's so convenient! After I've made my list, I can tear it off and take it to the store with me. I love the all-in-one page--I don't need a separate pad of paper, and my main grocery list is also not on the back of my menu page--if I unfold the page, I can see them side by side. Also, the different sections are marked--Pantry, Freezer, Produce, etc--which is so helpful. How many times have I been in the freezer section of the store, almost done shopping, when I realize I forgot to pick up an onion or lettuce, all the way over on the other side of the market? This should eliminate that. On the back of the list side is another page for "Shopping List" and "Errands". Again, I find this incredibly useful. I'm fortunate enough to live in a city where there are at least 10 different choices for groceries. The only problem with that is there are at least 10 different choices for groceries!! It gets confusing trying to remember who has what items on sale this week and who has better fruit or meat. I usually have my one go-to store where I get most things I need, but once a week, I'll also go to a couple other stores in search of a great deal or a better-tasting food. The main list, broken down by store section, will be for my regular grocery run. On the back, I'll record the handful of items I need from the other shops. There's a whole space for Notes on the flipside of the Menu page, and on a weekly basis, I'm not quite sure yet what I'll use that for, but I think it will be good for recipe hacks and prep notes. 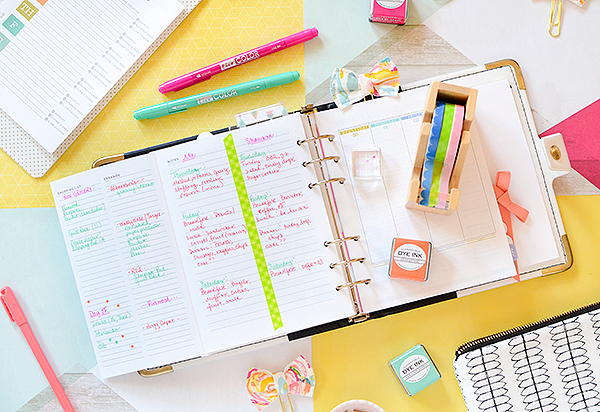 I've added 2 months of Meal Planner pages into my MI Binder Planner...at the moment, this is where I will keep them, in between weekly calendar spreads. 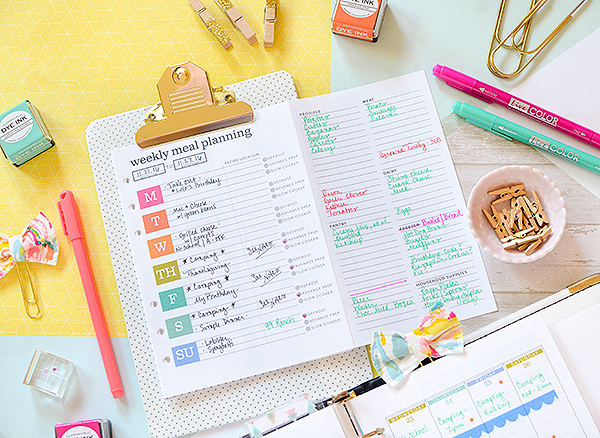 This may change as I get more familiar with the Meal Planner, but I like it this way because it's not an extra book to keep track of, and I can flip through the pages to see what we have going on during the week, which usually impacts what we have for dinner. Over Thanksgiving break, we've decided to go camping with some friends and have agreed with the other couple that we'll stick to a somewhat traditional meal on Thursday. We've divided up the menu, planned out each meal for each day that we're there, and discussed who's bringing the utensils and dishes and coffee percolator, and so on. 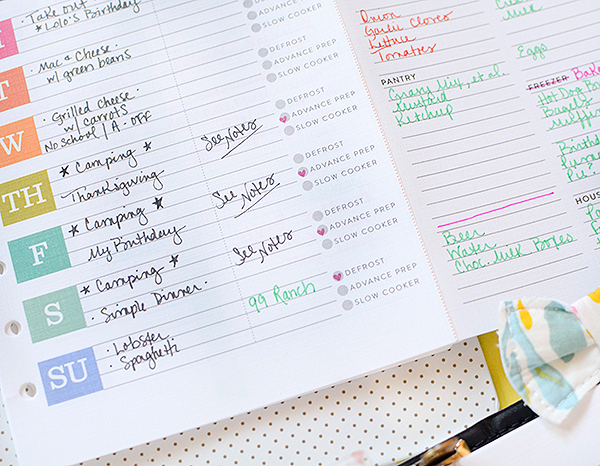 Until I received the Meal Planner, my notes were a jumbled mess on my phone. They were disorganized, hastily typed up, and incomplete. 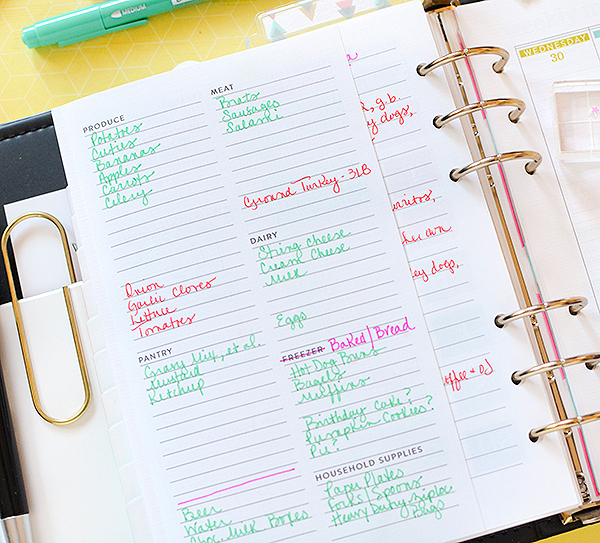 This Meal Planner was a life saver! Now I can look at the entire week, get a handle on it, and make coherent lists--because aside from Thanksgiving and camping, we've also got 2 birthdays, and a second Thanksgiving celebration happening. For the grocery list, I've written out our camping food in the green ink, and our Sunday dinner food in red. I'm only going shopping once next week so I'll get everything at the same time. I also crossed out FREEZER and replaced it with BAKED GOODS because it's more fitting for this particular occasion. On the back of my tear-off sheet, I sorted the various things we might need to get from the other markets, as well as non-grocery items we'll use and where to get them. 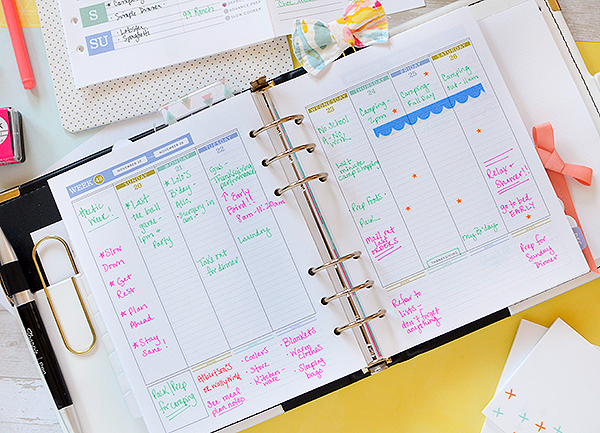 One page, multiple lists--organized and convenient. In the Notes section, which is a full page, I laid out our camping trip and inventoried each meal. As a divider, I ran a piece of skinny washi tape down the middle (it's NEW from PTI!). On the left is our family's contribution to camp food; on the right, the other family's. With everything preparing to camp out entails, I'm confident that this major task is in order and that's one less headache during a hectic week. I'm not a great cook, and honestly, have little patience for preparing a meal--you might say I'd rather be papercrafting :) While I don't love cooking, I would like to get better at it because I want to eat healthier and I'd like my kids to grow up sampling a variety of food. 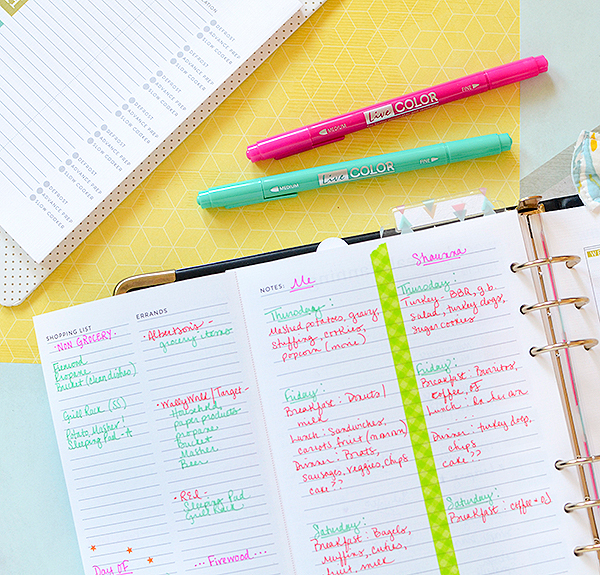 I think this Meal Planner is going to get a good workout over the next year and let's hope it introduces some positive changes into our meals and eating habits. Well done! I'm very excited...just got my meal planner. Love this and thanks for your ideas!! super cute idea! thanks for sharing.